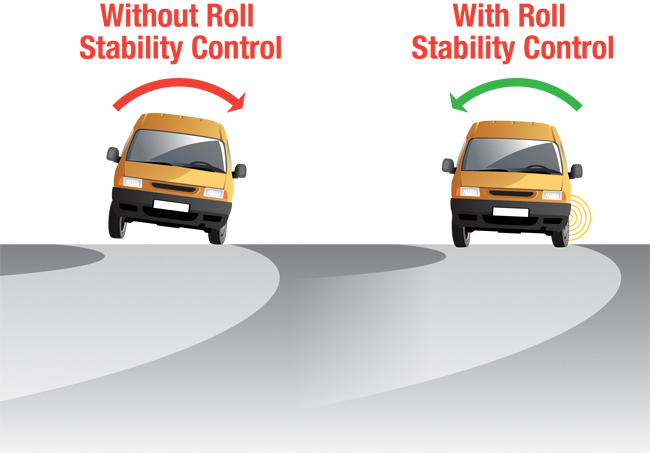 Roll Stability Control is active safety system which reduces the risk of rollover of the passenger vehicles in some critical maneuvers such as severe cornering and during steering suddenly. This system is especially useful for the vehicles having the high centre of gravity (C.G.) like SUVs as they are more prone to rolling over. While taking a turn, it may happen that the vehicle fails to keep contact with the ground & maintaining proper ground clearance resulting in a rollover, if the maneuver is critical and is done at very high speed. In such a situation, Roll Stability Control comes into action. RSC works with the help of a gyro sensor and Electronic Stability Program (ESP/ESC) of the vehicle. The gyro sensor continuously monitors the roll angle of the vehicle with respect to ground. If it is observed that roll angle of the vehicle is exceeding its normal limit, then this system reduces the speed of the entire vehicle or specific wheels by applying brakes with the help of ESP. Some systems also possess the ability to reduce the engine power. This system reduces the chances of tumbling over the curves. The effectiveness of this system depends on the overall condition of the vehicle, its maintenance, condition of tyres, tyre pressure and many such factors. RSC works only on the flat roads. This system does not take into account the rollovers caused by ditches on the roads. The wrong driver inputs may hamper the system function. So, it is always advisable to follow the safe driving practices and avoid total dependence on the technology. Home » Technical Anatomy » How Roll Stability Control works in a car? What Is The Function Of A Rear View Mirror In A Car? What Is The Meaning Of Front Wheel Drive (FWD) In Cars?